A Challenge has been issued! Today Coach Underwood and Coach Cloud went to the White Oak Brookshire’s to borrow three shopping carts to hold the canned goods that intermediate students were bringing to donate to the Temporary Assistance Program. Manager Gene Walker has issued a challenge to all third, fourth, and fifth grade classes. The Grade Level (3rd, 4th, or 5th) that brings in the most canned goods will not only win extra recess time as promised by Mrs. Parker, but they will also receive $50 toward a Grade Level Celebration courtesy of White Oak Brookshire’s. The canned food drives ends ON FRIDAY! This only gives you TWO MORE DAYS to bring those items in and place them in your grade level’s shopping cart. Much needed food items are canned meats, canned fruit and vegetables, canned soup with meat, dried spaghetti and sauce, ravioli, boxed dinners, oatmeal and cereal. We would like to encourage students to bring at least one food item. 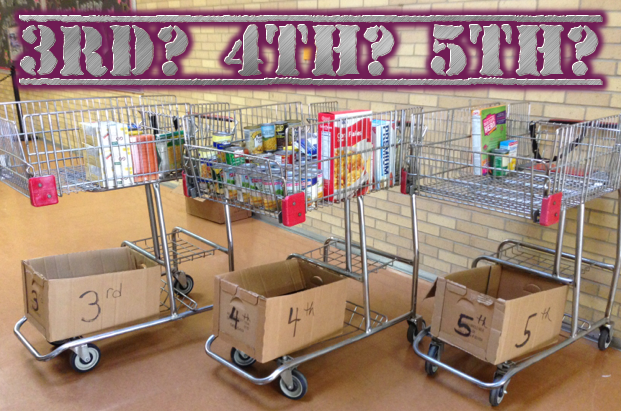 If every student brings just one, we will have more than 600 food items to donate! We will have representatives from the White Oak Temporary Assistance Program (TAP) here on November 22nd to accept our donation. Let’s fill those baskets until they overflow. This entry was posted in Uncategorized by Mrs. Odom. Bookmark the permalink.